December | 2014 | #Hope lives! I guess I got lost even before I found myself, or learned society’s way to happiness. While my contemporaries were striding into IITs and Ivy Leagues, I was crawling through the complexities of my daily existence; in a fog of chemicals and smoke. Others set stringent targets for themselves and lofty goals for measuring their success. I just had a fuzzy and hazy approach to life in general. Most of my dreams went up to my excitedly pounding brain, or beating heart, only to collapse inward soon after, when the distance between desire and reality became apparent. As my friends started to reach for the pinnacle of their career paths, I was still unable to find my North Star, amidst this quagmire of life’s varied choices. My early contemporaries in Delhi had bright eyes and spoke of future conquests of new frontiers and scientific breakthroughs, while I struggled late into the black night, red eyed; still trying to decipher Joe Cocker’s rendering of ‘A little help from my friends’ at Woodstock, or Jimmy Hendrix or Bob Dylan’s twanging on his guitar. The Boston professor’s son, who visited; listened to Beethoven, Tchaikovski with his blonde girl friend, and he was very American in his upbringing and conservative in outlook, despite his clear Indian roots. My idea was of a different life style; more in the Haight Ashbury or Soho vein, and a lot loser in concept than his determined life. My offer to introduce them to Pink Floyd and some lazy smoke was harshly declined, and we spent the day studying at the Art Museum instead. Men made it to the moon and more, and I barely made it to Dalhousie; in time for my second Buddhist meditation course, with Goenka. While others struggled against mighty and at times heroic odds, I dawdled and dithered. Their path seemed so illuminated, bright and straight; while mine was lost in the woods and I often had to backtrack and start again. Like the brilliant plan to do two years of college work in 15 days, for the final graduation in a burst of glory and imagination. Others would look at me earnestly, and define their plans for the next ten years; and then soon move on to even weightier subjects, and I would nod solemnly in agreement. My own struggles were still centered on how to find meaning in my everyday life, and every minute seemed uncertain, and the wind blew me here and there,. on the surface of this ocean of life. My mother, wife and daughter complained I lacked purpose and made great efforts to regulate, support and help to extend my life’s goals, as if I had lost it in the woods by mistake. Now my contemporaries are happy in all that they have accomplished, while I scrutinize my financial statements hoping to find the clues; to a hidden treasure. My companion’s vacations are well planned and at prestigious locations. I believe a week end searching for that perfectly worthless afternoon; after a morning haze, is well spent. Their companions are social butterflies and gregarious beings, while I am often grumpy at best, and delirious at worst. They love their latest electronic gizmos and are globally connected, while I am still struggling to understand the opening verse of the Isa Upanishad. They are full of passions, desires and so much more culturally aware, and have stuffed their homes with priceless collections; of their favorite toys. I only seek that emptiness within, wherein bliss blooms like a lotus. It is a different path I know, from the others around me; and moreover I know not where it leads. I seek out my cravings one by one, and examine each one at my leisure, and then cast it away. I become a naked stranger to myself, and find that happiness and fulfillment are my companions on this path. It is not that I have found a unique scientific method, gizmo or drug that is the elixir of desires for eternity. This path of renunciation and compassion is for the poor, depressed, hopeless, faithless fellow creatures of my modern universe. I look in the mirror and find that the more things change, the less lost I become. Happiness and fulfillment have always been here with me, and only when I am lost in this empty bliss, are they found. Wisdom rides my compassion, and my companion complains that I have drunk overmuch, from her fountain of eternity, and our contentment glows. As the slow pace of growth continues in most global economies, banks have nowhere to invest their money; as they do not want to risk giving loans. Forecasts that deposit rates would rise from near zero have been proved wrong for six years running, as the global financial system remained fragile and growth fails to reach pre-crisis momentum. In fact the European Central Bank and now the Swiss Central Bank are charging major banks money, to hold large deposits. The rush of money coming out of Russia and other troubled economies is leading to these negative interest rates, as the Euro and Swiss Franc are being driven higher. This may also lead to deflation which will be the central bank’s nightmare, given the anemic growth rates. At a time of falling commodity prices like oil at below $ 60 a drop of 50% from recent prices and iron ore at new lows, there is a time for economies like India and China to rejoice; but they are suffering their own growth pains. The Chinese are struggling for a soft landing and the Indians are looking for a hard take off and neither can carry the world economy forward. The beacon on the hill remains the US which despite its dysfunctional government, continues to plow ahead in economic growth. Its old rust belt is suddenly starting to gain in manufacturing activities, and new productivity gains continue to rise; due to innovation and technology breakthroughs. Fracking has finally driven oil prices to levels where we will all have a little extra spending money, in our pockets. This is all happening while the rich continue to get richer; and the poor are increasing in number and have decreasing opportunities available for education and employment. The digital divide and the disparity in wealth continue to grow. Average wealth of the upper middle class doubled from $ 300,000 to approx. $ 600,000 from 1983 to now. The lower middle class and the poor have increased their desperation in the meantime; and are barely able to make a living wage, much less accumulate wealth. Their world has turned upside down as upward mobility has stalled and the American dream is turning into a daily nightmare. Broken families are struggling just to survive and remain human. There are no easy fixes, as we are facing a world of uncertainty. While the American consumer continues to be fearless and is ready to start the race to spend even more, the rest of the world is still oiling its economic engine. The race may have been lost even before it began, as the animal spirits that are supposed to encourage economic growth; is strangely missing, in most of the world. The conservatives husband their wealth and the liberals are largely discredited and have been cast into the political wilderness. Obama stands alone while the congress dithers. Senator Warren warns that nobody is looking after the needy and senators across the aisle tell her, welcome to Washington. Jeb Bush will be the next President and then we will have the makings of a truly great nation, as he declares war on Russia, Pakistan and any other nation that the military industrial complex, chose next. Oh and my only wish is that my guardian angel will give me so much wealth, that my grandchildren will happily pay their bankers; to just keep it safe, for their trust fund babies! Do we even notice the messages that the companies are trying to communicate? Well if you are like me? then you would be blissfully unaware of these messages, that our brain consumes on a daily basis. From the rays of the interstellar stars long dead that pass through us; to the varied spectrum of rays that our eyes cannot see; to the dark matter that makes up 96% of our known universe, what else is going on that we are not aware of? Even our inner voice is confused, as what it says is conveniently forgotten; cloaked by our desires, we get better at ignoring any hidden messages, due to the sensory overload we face in today’s modern world. It is time to turn off the world, and take some time off; and still this madness, that thrives around us. Chaos is no longer an abstract theory, but fast becoming a way of life; as we strive to succeed, against ever most complex odds. So step off this conveyor urban belt; and step onto a meadow, or walk along a ridge, and look at the vistas of nature. There is so much more to our existence, than the next consumable item; that we purchase. As our desires increase, we are driven ever deeper into the world of Maya, and our ego blooms. The more we have, the more we desire and yet remain unsatisfied. Even after attaining the object of desire, we need more and more objects; as desire, will never be fulfilled. There is a deep and permanent gap between these desires, and reality. We go on in an endless circle just loving ourselves, and our dear ones, and trying to fulfill our desires. Desire itself is not bad and we need it to better civilization, and our existence. It is when we become slaves of the fruits of our desires, that we lose the simple pleasures of existence. When we just enjoy that cup of tea, or that sight of a beautiful flower or tree; then we know that nature has its own celebrations with its bounty. The joys of the seasons, the changes in our weather, the wondrous landscape, the running brooks, the soaring eagles, the deep oceans; all show the uniqueness, of our existence. We are born for happiness and delight, but we forget that our nature is in essence a beacon of hope; and all we need to do is light it, with our compassion. Empathy to those around us; is more important; than the next palace, or personal fortune. Being oneself is the simple way to recognize the good in everyone around us. When we conquer our desires; it is not that we become weak, instead we become the hidden force of our universe, and can help spread hope, faith, light and love around us. One often wonders if being frugal and thrifty; may be the ultimate weapons to use, in the pursuit of happiness. The words of Franklin that, “A penny saved is a penny earned”, maybe the last words in this philosophy, and no wonder we feel great; when we get a bargain. On the other hand if nobody spends, there will be no economy; so spend, we must. The challenge remains on how to remember the important stuff, while leading our everyday life. We need to experience this world; as life is more memorable, only when we make an effort to enjoy our journey here. Above all we need to remember the fact, that happiness is not an object, but just a condition of one’s mind. It is not from obtaining objects that one attains happiness. Objects are transitory and one often loses interest soon after acquiring one.We deserve a good life and life well lived begets happiness. We need to chill and take more vacations and just enjoy the moments. 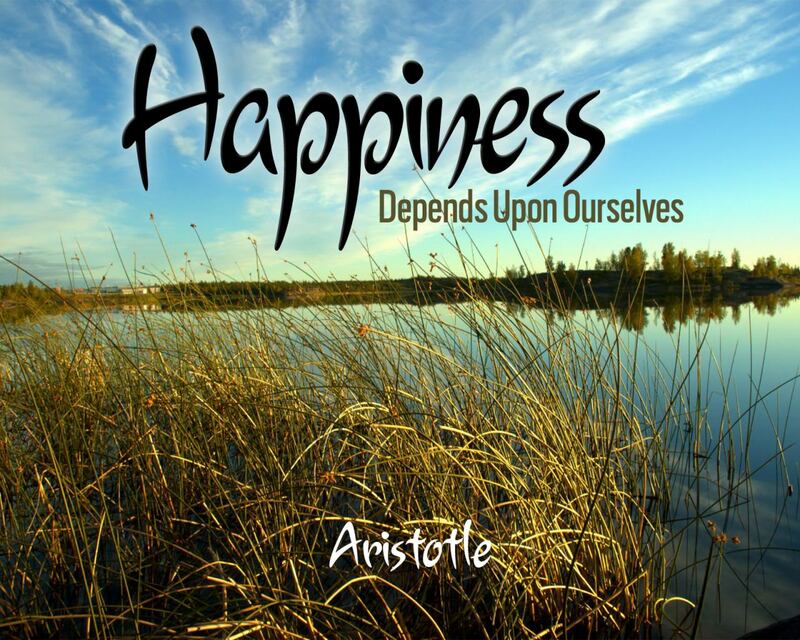 It is from our existential experiences that our states of happiness arise. We do not need wealth and expensive objects, to make oneself happy. A great time spent traveling and being with people one loves; is a greater boost to the state of everyone’s happiness, than say buying a diamond ring. We do need enough to live comfortably; but beyond that the pursuit of objects, which is becoming a part of modern life, is not sustainable. Hence we see the widespread unhappiness, even as we continue to consume more. Our happiest moments come from our experiences; and the more pleasant can often revive our spirits, even in the future. It is well known that happier people also earn more, and are often more successful. If we take care of our state of mind and change our thinking, to look at world more optimistically, then the universe will conspire with us. We only have to live here and experience the universe around us; and soon we will have all we need, and our good vibrations will spread outwards. Others around us will become happier, and then we can say in empathy, that yes, this is a life well worth living. So just relax and learn to enjoy this moment, as it is all we have. The object of happiness lies within me; and let me spread it out around me. Only then can I say, that yes I have lived a good life.